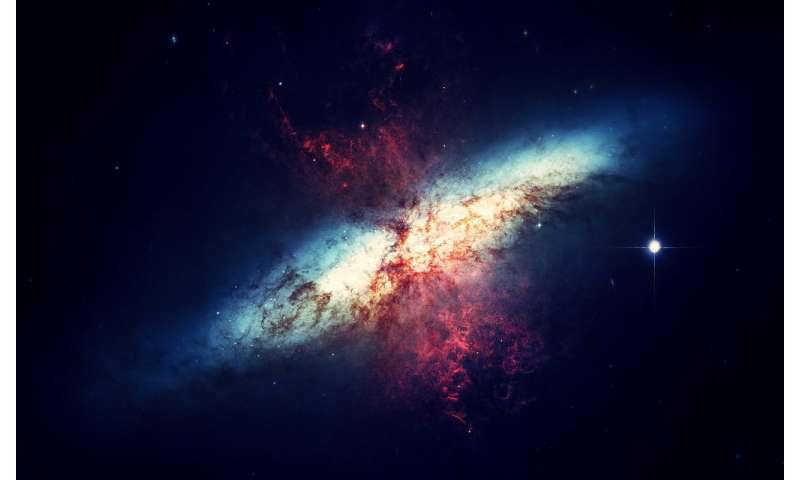 A group of researchers led by Paula Sánchez-Sáez, a doctoral student in the Department of Astronomy of the Universidad de Chile, managed to determine that the rate of variability in the light emitted by material being swallowed by supermassive black holes in nuclei of active galaxies is determined by the accretion rate, that is, how much matter they are "eating." "The light emitted by the material that is falling (its brightness) changes a lot over time, without a stable pattern, so we say that they show variability. We know that it varies, but we still do not know clearly why. If one observes other objects, such as stars or galaxies without active nuclei, their brightness is constant over time, but if we look at galaxies with active nuclei their brightness rises and falls, and is completely unpredictable. We studied how the amplitude of this variation in the emitted light (or in simple words, the amplitude of the variability) is related, with the average luminosity emitted by the AGN, the mass of the super massive black hole, and the AGN accretion rate (which corresponds to how much material the black hole consumes in a year). The results of our analysis show that, contrary to what was believed, the only important physical property to explain the amplitude of the variability is the AGN accretion rate," explains the young researcher. The study determined that there is only one physical property that could predict the variability of these objects: the accretion rate. "This is nothing but how much material is falling into this supermassive black hole. So if it is on a diet, or if it is swallowing a lot or if it does not fit anymore in his mouth... that will determine if they vary much or little. And what we detect is that the less they swallow, the more they vary," explains Paulina Lira, an academic from the Department of Astronomy of the Universidad de Chile, and a researcher at the CATA Center for Excellence in Astrophysics. For Paula Sánchez-Sáez, first author of the study, the importance of this discovery is to try to elucidate what is the physical mechanism behind this variability, one of the most inherent characteristics of the active galactic nuclei. "The results obtained in this study challenge the old paradigm that the amplitude of the AGN variability depended mainly on the luminosity of the AGN. This was believed because measuring the mass of black holes is not always possible, so the measurement of accretion rates could only be done accurately for a few objects, but with the SDSS data it was possible to measure these physical properties for a sample of the order of 2,000 objects, which were also observed by the QUEST-La Silla AGN Variability Survey. In addition, from our variability survey, we were able to obtain very good quality light curves for a large sample of objects, so we could study the variability of each object independently, which was not possible before for a large sample of AGN. Combining the fact that we had precise measurements of AGN physical properties, in addition to a good characterization of the variability of individual AGN, we could determine that the main factor that determines the amplitude of the variability is the accretion rate, or in more technical words the Eddington ratio," she says. The data used in this work comes from two sources. For the variability analysis they used data from the QUEST-La Silla AGN Variability Survey (led by Paulina Lira), which was carried out between 2010 and 2015, observing 5 extragalactic fields. For the study of the physical properties of the AGN, they used public spectral data from the Sloan Digital Sky Survey (SDSS). In the future, the researchers will seek to study the time scale of variability of these active galactic nuclei. "Another very important property is the time scale of variability of these objects. To measure this property accurately we need to have light curves with a coverage of more than 10 years. So we must wait until future surveys, such as the Large Synoptic Survey Telescope (LSST), provide more photometric data, so we can combine these data with our data from QUEST-La Silla AGN variability survey to extend our light curves to an order of 20 years," says Paula.